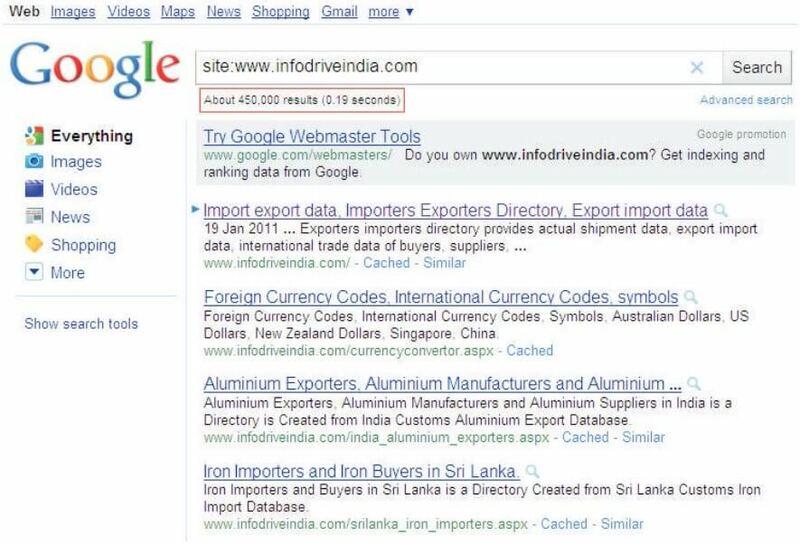 "Techmagnate identified the loopholes on the website and created a strategic action plan to help increase the number of pages identified by Google for its web index"
Infodrive India is India’s no. 1 provider of Competitive Business Intelligence reports on Export and Import data. The company has some of the largest and most comprehensive databases of importers and exporters across the world. These databases are available either by country e.g. China Importers directory or by product e.g. directory of Indian Basmati Rice Exporters. Infodrive India has evolved itself as a company with a unique blend of knowledge of practical requirements of Exporters Importers , a International Network of Trade data sources and high end IT technologies to deliver Export Import Business Intelligence Information in most user friendly & cost effective manner. In addition to this, the company is also a one-stop-shop for all information on India trading rules, laws, regulations, customs exchange rates, important addresses and contact numbers etc. Infodriveindia.com came to Techmagnate with a specific objective. The website had more than 300,000 pages. However, only 30,000 pages were being indexed by search engines. The client was adding another 150,000 pages that were related only to products (e.g. abrasives importers, abrasives exporters, textile importers, textile exporters). For actual profitability and sales for Infodrive, it was important that these product-related pages show up in top search engine results. This was a cause of concern because search engines were not caching the most important portion of website. The challenge was to ensure that all the new 150,000 pages would be indexed by search engines. We also had to deliver top 5 rankings for each product keyword. Moreover, the HTML and XML sitemaps were not conducive to SEO and the SEO team would also have to create huge XML site maps. Techmagnate had a mammoth task at hand, but the team was all set to deliver. The team of expert SEO analysts at Techmagnate identified the loopholes on the website and created a strategic action plan to help increase the number of pages identified by Google for its web index. Increased the volume of content on website so that the website got indexed more frequently. Divided XML sitemaps based on categories, subcategories and the markets. The number of indexed pages in Google has increased. Now the website has approximately 500,000 pages indexed on the search engine.